Alejandro Valverde breaks a four-way tie for most wins in men's Fleche Wallonne, but the race has changed a lot over the years. 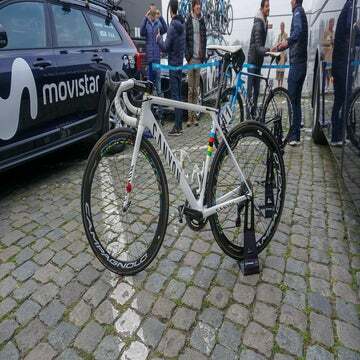 Alejandro Valverde (Movistar) carved his name in the record books with a fourth Flèche Wallonne victory Wednesday, surpassing such greats as Eddy Merckx and Moreno Argentin, who only have three wins apiece. With a master class on how to race the Mur de Huy, Valverde bested the Etixx – Quick-Step duo of Dan Martin and Julian Alaphilippe becoming the best rider in the history of the men’s race. With four victories, Valverde is unquestionably the king of the Mur, but comparing him to other former winners can be tricky business. Dating back to 1936, the “Walloon Arrow” is long considered a major feather in anyone’s cap. Just below “monument” status, the Belgian classic was once part of the Ardennes weekend, with Flèche held Saturday, followed by Liège-Bastogne-Liège on Sunday, with the race’s date and course evolving over the years. It’s interesting to note that Marcel Kint’s victories came right in the middle of World War II, making it one of the few that was not cancelled during the European conflict, winning three on a trot from 1943-1945. Merckx’s first win came in 1967, and he added more in 1970 and 1972, two seasons when he also pulled off the Giro d’Italia-Tour de France double. Kint’s and Merckx’s wins are significant because the finish line was on the flats, in the cities of Marcinelle or Charleroi (in 1945), meaning that the race was decided in breakaways or reduced-bunch sprints. The race’s character was forever changed when the emblematic Mur de Huy hilltop finale was introduced in 1983. The race then became a much more tactical chess match up the brutal Belgium hill with ramps as steep as 26 percent. At 1.3km, with an average grade just under 10 percent, the Mur wall has since become one of cycling’s most famous finishing climbs. Grand tour climbers like Chris Froome (Sky) are never going to win up the Mur de Huy (though he was close, with second to Joaquim Rodríguez in the Tour’s stage 3 last summer that finished atop the Mur), but the explosive, intense effort is perfectly suited for riders like Valverde, whose climbing legs and finishing speed are a deadly combo. With the Mur as the finish, a different kind of rider started to win Flèche. Bernard Hinault won the first edition up the Mur, adding a second title to his victory on the flats in 1979. Moreno Argentin won three — 1990, 1991, and 1994 — and the final victory by “il capo” came as part of the infamous and unprecedented Gewiss podium sweep, with Argentin, Giorgio Furlan, and Evgeni Berzin riding away from the entire peloton, a performance that confirmed that something odd was happening inside the sport of cycling. Michele Ferrari, then the team’s doctor, made his famous orange juice comparison to EPO in a post-race press conference. Lance Armstrong became the lone American winner two years later, just months before his cancer diagnosis. Davide Rebellin won three — 2004, 2007 and 2009 — with his third win coming just days before Italian Olympic officials announced he tested positive for CERA after winning silver in the 2008 Beijing Games. He eventually served a two-year doping ban, and continues to race at 44, but hasn’t race Flèche Wallonne since 2009. His CCC – Sprandi team was not among the wildcard invites this year. It could be argued that Valverde’s first win in 2006 might also deserve an asterisk. He later served a two-year ban in 2010 after being linked to a blood bag kept in a freezer managed by Spain’s infamous doping doctor Eufemiano Fuentes. Since his comeback in 2012, Valverde has simply gotten better with age. Why is Valverde untouchable on the Mur? There are a few reasons. Even more so than a decade ago, the strength of teamwork is key. To win Wednesday, Valverde counted on his teammates to control breakaways, and then cover late attacks, with Ion Izagirre following a move with Bob Jungels (Etixx – Quick-Step). Movistar then perfectly positioned him at the front for the day’s third and decisive assault up the Mur. Valverde wasn’t nose to the wind until the final 600 meters of the race. And even more important in today’s peloton is measuring efforts, opening the throttle with tactical precision. Attacks even 200 meters too soon can peter out, such as Joaquim Rodríguez (Katusha) and Martin’s early accelerations. Valverde clearly is a master at measuring his efforts, and knows how to hit his power on the Mur to perfection. And experience counts, too. With 11 career Flèche starts, Valverde now knows the Mur as well as anyone in the peloton. However, when talking of records, it’s worth remembering that the real record-holder up the Mur is Marianne Vos, who has won the Flèche Wallonne Feminine five times. Valverde promises to return in 2017 for one more try.